New Age of Battle Pets: Create Your Legion of Pets! Battle Pets are mystical creatures that have recently appeared on Sapphire one after another. Perfectly suited to be faithful companions for adventurous Heroes, many players have seeked to unlock the true potential of their Battle Pets. 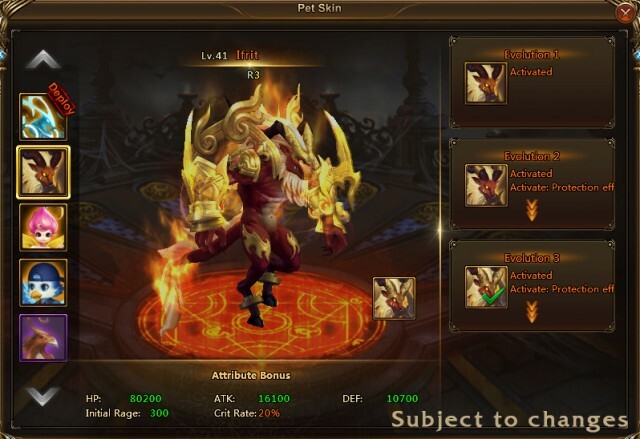 Check out all the new features coming to League of Angel II’s Battle Pet system and watch your B.R. skyrocket! Equip Battle Pets with Energy Gems and activate their hidden powers! In the Awaken panel, players can click the Energy slots to insert Energy Gems, which provide bonus to base attributes and Pet Grace effects. 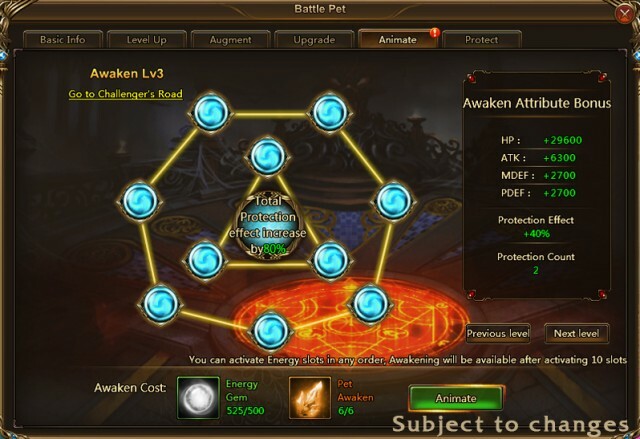 After filling all the Energy slots, players can awaken their Pets and gain Awaken Attribute bonuses. The higher the Awaken level, the more Pets can join in Pet Grace! As Pets begin to unlock their dormant powers, some amazing changes to Pet appearances are coming as well! Players can now collect Pet Evo-2 and Evo-3 Seals to unlock new Evolutions! When Pets successfully evolve, they gain fantastic new appearances and significantly improved attributes to enhance Pet Grace effects! Battle Pets are loyal companions, more than willing to protect your Heroes in battle. Their blessings bestow important attributes for players to boost their B.R.! 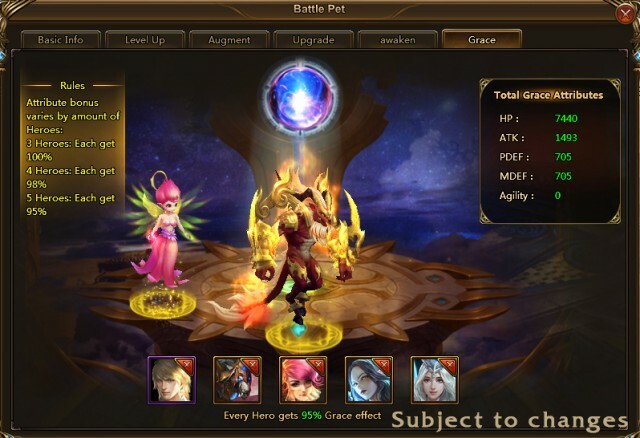 The attributes of all Pets participating in Pet Grace will be totalled and split evenly to Heroes in the squad. Pets’ attributes, Grace effects, and Evolution level will affect the total attributes of Grace! Note: Players need to add at least 3 Heroes to their squad to activate the Pet Grace feature. League of Angels II is excited to usher in a new age of Battle Pets! Experience the epic free to play MMORPG now and let your mighty Battle Pets lead you to victory! Next：The First Mythic Soul Arm of LoA2 is Born!